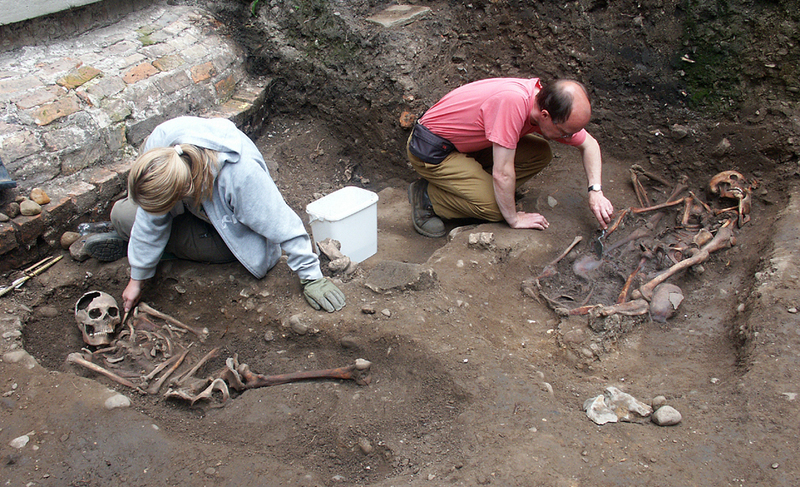 Six years ago archaeologists in York unearthed 80 skeletons. 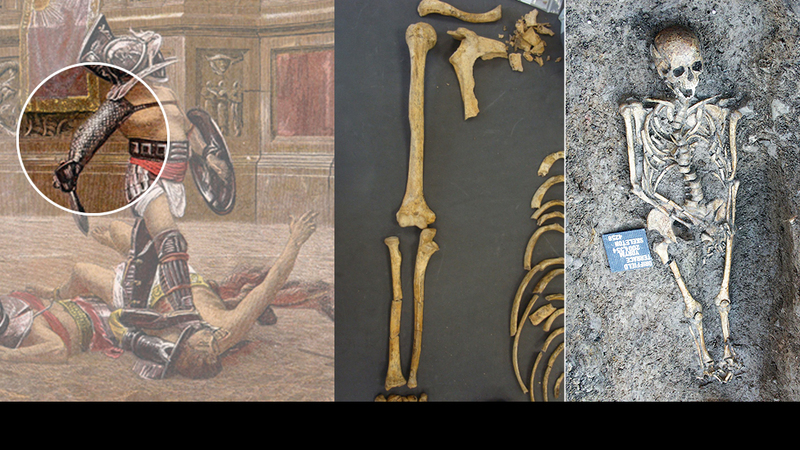 Of the 60 or so complete skeletons, many showed signs of a violent death. After years of research the York Archaeological Trust believes that they may have been gladiators. One in three of the skeletons found had one arm at least 5cm longer than the other. This is consistent with the effect of one-sided work from an early age such as regular sword practice. The cleaned up bones on the left are from the skeleton on the right. 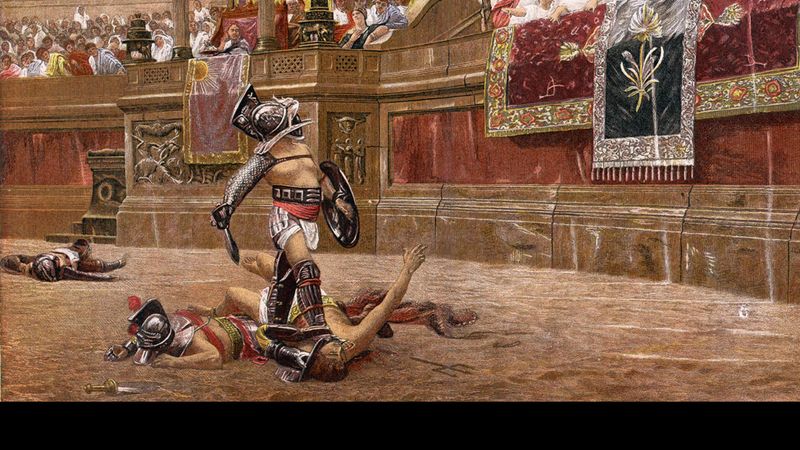 Gladiator fights were brutal affairs. 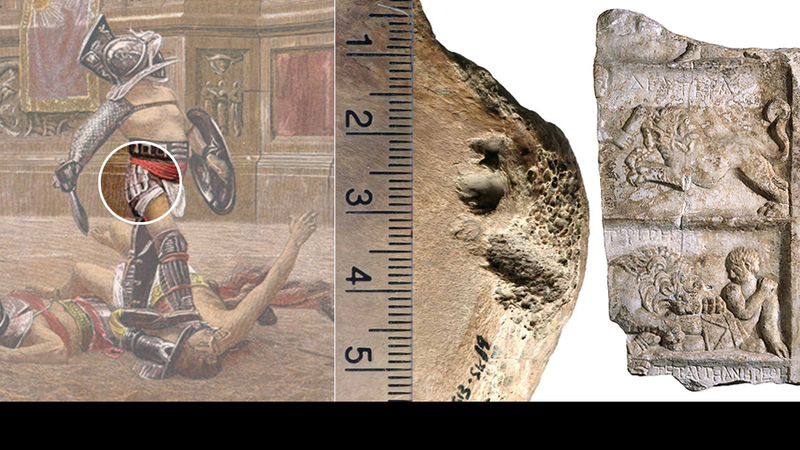 This jaw bone shows evidence of a deep cut, probably inflicted by the fighter's favoured weapon, a "gladius" sword, an example of which is shown below. It's not clear if the blow would have been fatal. 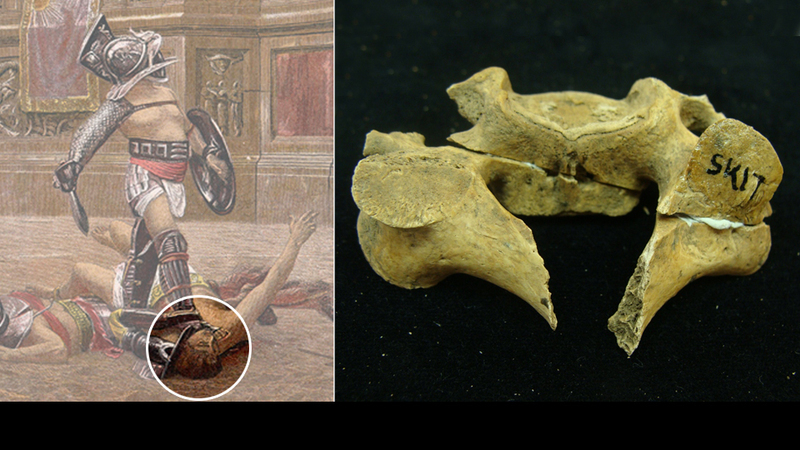 One of the skeletons had evidence of injuries inflicted by a large wild animal such as a bear, tiger or lion. Here you can see the deep indentations to part of the pelvis. On the right is a Roman marble relief showing a fight between a man and a lion. 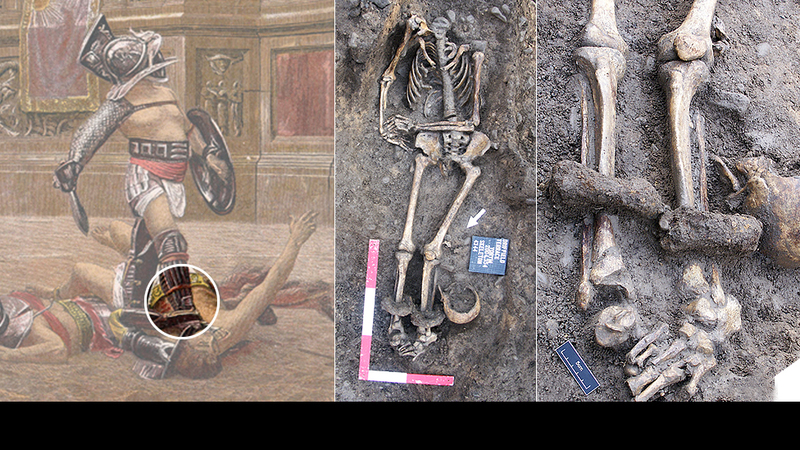 One of the skeletons has what appear to be unusual solid metal leg rings. They don't appear to be shackles and the bones show signs of infection indicating they had been worn for some time. They may have been symbolic, perhaps of slavery, the experts say. 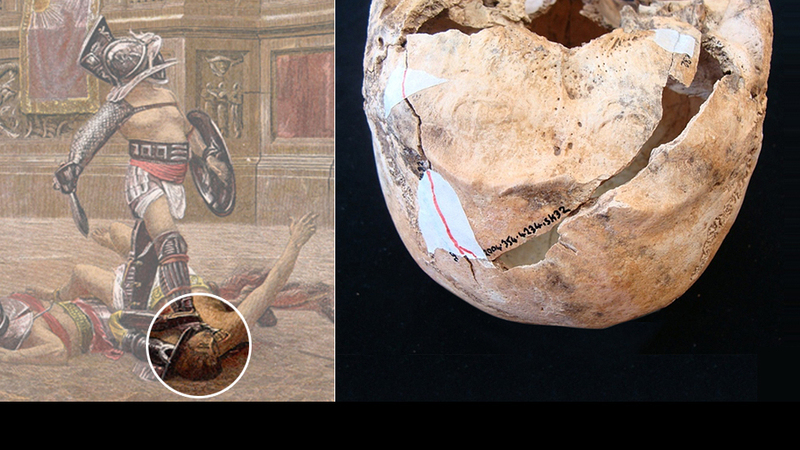 Vanquished or dying gladiators were often finished off with a blow to the head. This skull, showing the back of the head, has a long crack running from top left down to the bottom right, evidence of having received a heavy blow with a hammer type weapon. Fifty of the 61 complete skeletons had been decapitated. This cervical vertebra shows a clean cut to the "spinous process" indicating that a mortally wounded or losing fighter was dispatched with a sword thrust through the neck. The photographs and expert view were generously provided by Kurt Hunter-Mann (on the right) of the York Archaeological Trust. 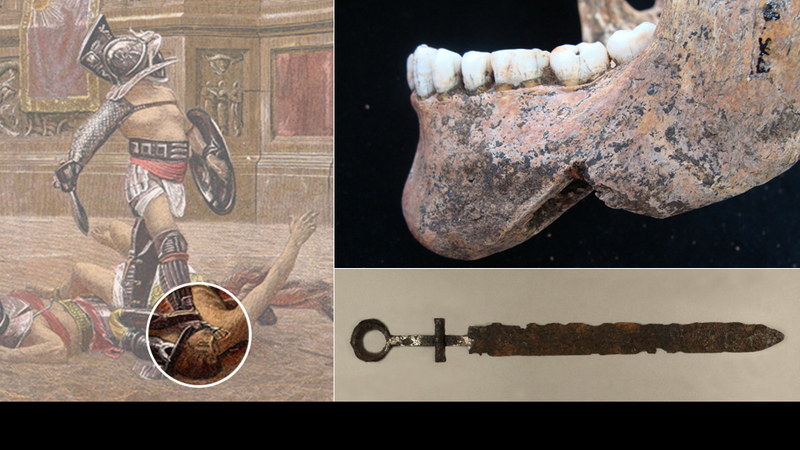 The images of the Gladius sword and marble relief are courtesy of the Trustees of the British Museum.